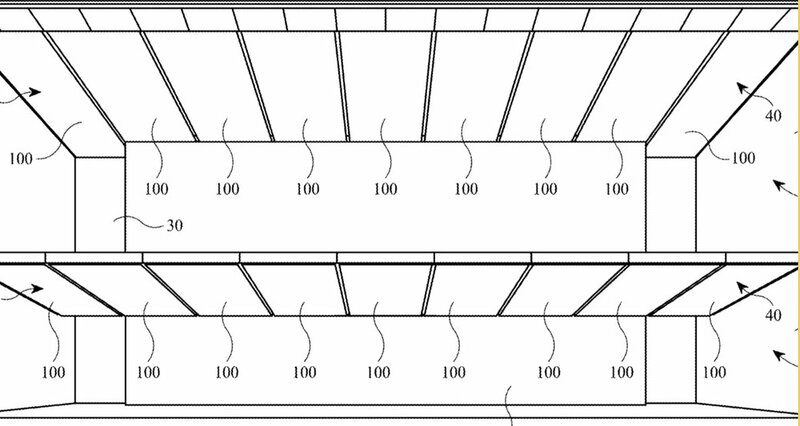 Apple has been granted a patent (number 10,101,002) for a “light fixture with fabric layer having printed dots” — in other words, the light fixtures in its retail stores. The invention relates generally to a light fixture and specifically to a light fixture that produces light having particular color characteristics. The light fixture includes a frame, a light source disposed within and coupled to the frame, and a lens coupled to the light source. The light also includes a first fabric layer coupled to the frame at a first distance from the lens and a second fabric layer coupled to the frame at a second distance from the lens. The first fabric layer has a plurality of dots printed thereon.